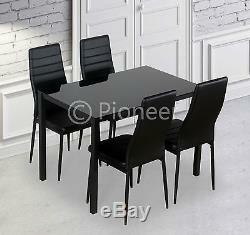 Black Glass Dining Table with 4 Black Chairs. 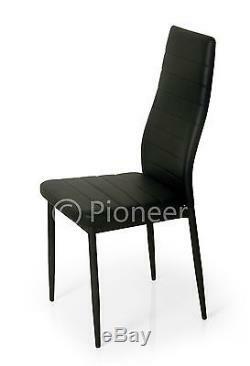 Black 4 Chairs Dining Set. Made By The Manufacturers of Costway and Wayfair. Tested UK Fire retardant Chairs & Table for your safety. 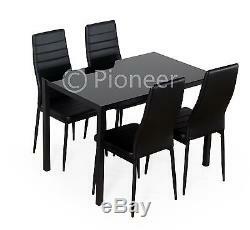 Flat pack made of Black Metal Dining Table with 4 Black faux leather chairs, a great value. Crafted carefully to ensure high quality finish. Professional manufacturers and suppliers for large retailers across Europe & USA. (Extra long table and wide chairs for comfortability with all screws and essentials included). 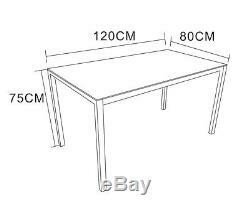 Dimensions of the Table(Wider than other sellers). Length of the table: 120 cm. Width of the table: 80 cm. Height from the floor : 75 cm. Nsions of the 4 Faux leather Chairs(Bigger seat pads than other sellers). 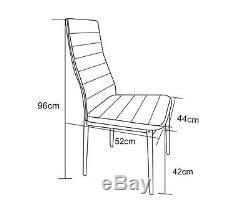 Chair : 52 cm x 42 cm (Approx). Pay By 12pm - Same Day Dispatchment. Additional Charges may apply for the following Region. Scotland Postcodes DG, TD, KA(1-26), ML, EH, G(excl 83), KY, DD, PA 1-19, FK(excl 17-56), PH excl (11-50), (AB only 10/11/12/15/16 24 & 25). Scotland Highlands (Zone C) PA21, PH11+, IV, KW, KA 27-28, AB, FK17+ , G83. Northern Ireland (Zone D) BT NORTHERN IRELAND. All Offshore ireland (Zone E) (Po) (we dont deliver). Channel Islands (Zone G) (we dont deliver). Please note any erected or semi erected item can't be accepted. Bank transfer are also accepted. Please allow 3 working hours for our response, however we try to respond ASAP. The item "Glass Dining Table and 4 Black Chairs set table and chairs kitchen furniture" is in sale since Wednesday, October 26, 2016. This item is in the category "Home, Furniture & DIY\Furniture\Tables\Kitchen & Dining Tables". The seller is "pioneerfurnitureuk" and is located in Tilbury Essex. This item can be shipped to United Kingdom.